JBMail » Скачать софт бесплатно? Лучший бесплатный софт! JBMail - компактный портативный почтовый клиент. На столько компактный, что может работать с подзабытого флоппидиска. JBMail предназначен для сбора почты с любого компа подключенного к инету таким образом, чтобы на этом самом компе никаких следов не отсавить. JBMail поддерживает POP3, SMTP, SSL/TLS. JBMail runs on Windows 95, 98, ME, NT 4.0, 2000, XP. Although there is no direct Linux/UNIX support yet, JBMail runs nearly perfectly under Wine v20041201 (even with SSL/TLS connections). Security and Privacy. JBMail uses smart technology choices to eliminate the security and privacy hazards found in other mail clients, without sacrificing interoperability. For instance, HTML is stripped to plain text and not rendered. Full SSL/TLS support. Secure Sockets Layer and Transport Layer Security use state-of-the-art encryption to protect POP3 and SMTP communications from eavesdropping and spoofing. Provided by the industry standard OpenSSL. Virus protection. Multiple levels of defense against viruses, worms and trojans. Safety features include a file block list and executable file SanityCheck. Junk mail filtering. JBMail includes powerful junk/spam filtering capabilities, including whitelist and blacklist, heuristic custom filters, and even header pattern matching. Portability. Fits on a floppy disk; no install required. No local mail storage, and no registry keys created. Messages can be viewed and saved/archived in plain text format to guarantee cross-client and cross-platform compatibility. Efficiency. 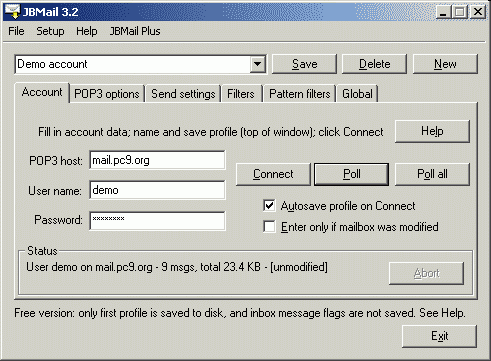 Header-based POP3 access lets you read and delete mail directly on server without downloading everything. Light-weight software is nimble even on old computers!